Wealth and income inequalities have to be reduced and corporate power challenged to achieve health for all, say participants at the fourth People’s Health Assembly. Posters in several languages from across the globe adorning the venue, activists from South Africa breaking into a Zulu song in the midst of the opening plenary session, a professor from New Zealand ending her speech with a Maori slogan. Nearly 1,400 registered delegates are participating in the Assembly, which will go on till November 19. Eduardo Espinoza, the deputy health minister of El Salvador, who delivered the keynote address at the opening plenary session, said the dominant development model in the world today had led humanity to a civilisational crisis. Increasing inequality, privatization of public services, and unfair Free Trade Agreements (FTAs) imposed on countries with the illusory promise of jobs were among the processes which formed part of this development model, Espinoza said. All of these have severe and adverse impacts on public health. Patents and intellectual property regimes had stiffened in favour of profiteering by multinational corporations, contributing to drugs becoming more expensive, he noted. While there is growing meddling by pseudo-philanthropic organisations in the health sector, the idea that is being promoted is that each person will have as much health as he/she can afford to buy. There are positive developments in parts of Latin America, where national health fora demanding significant reforms that enable the full exercise of the right to health have emerged. But the progressive governments of the region which are trying to bring about such reforms are being sought to be undermined from outside by international capital, which sees the development of social movements as a threat to its interests. Countries like Cuba, Venezuela and El Salvador were being subjected to tremendous military and economic pressures by dominant powers led by the US, he pointed out. Displacement and migration, fuelled by armed conflicts and frustrated hopes of better living conditions, have meant worsening health outcomes for large numbers of people. Environmental degradation and pollution, which have led to global warming and climate change, reflected in the increasing frequency of extreme weather phenomena, are worsening the health crisis. This situation is not spontaneous, but the result of human activity. We should not fall into the mistake of ignoring the social determinants of health as many are prone to, Espinoza added. “There is no way forward other than changing the development model which has resulted in the current crisis,” he said. But, “will we be brave enough?,” Espinoza asked as he concluded. David Sanders, emeritus professor at the University of Western Cape, South Africa, who spoke after Espinoza, said analysis showed that if there was no change in the current development paradigm, 207 years and 3 or 4 planet earth would be needed to reach the sustainable development goals (SDGs) set by the UN General Assembly. Sanders, who is also the co-chair of the Global Steering Council of the People’s Health Movement (PHM), highlighted the growing global health inequalities – between the rich and the poor globally and within countries, and between the rich countries and the poorer countries. The risk of a child born in Sub-Saharan Africa in 1970 dying before he or she turned five was 9 times that of a child born in an industrialized country. By 2015, it was 11 times higher. The key underlying causes of global health inequalities include poverty and increasing wealth and income inequalities worsened by neoliberal globalisation, selective public health care and inappropriate health sector ‘reform’. Economic, social and environmental determinants of health include employment levels and conditions, food and diets, living environments and climate change. Neoliberal globalization has had an adverse impact on all of these. “Civil society, including health professionals and students, need to urgently challenge the inequitable macroeconomic regime and inappropriate policies through evidence-based advocacy and social mobilization,” he said, before giving an overview of the People’s Health Movement, which is geared towards mounting this challenge. Chiara Bodini, co-chair of the PHM’s Global Steering Council, spoke about building a movement for health. This involved building relationships and values, organization and strategy, visible actions (such as advocacy and policy dialogue, campaigns and demonstration), participation, networking, and learning from experience, she said. Challenges for the movement included diversifying the resource base, and communicating effectively to popularize the movement’s message, she added. The plenary session that followed dwelt on the theme of the political and economic landscape of development and health. Morbid symptoms that are all around us today include inequality, poverty, instability, alienation, displacement and ecological collapse. If what would emerge out of all these is to be a genuinely progressive alternative, people’s movements need to work together. Speaking on trade and health, she said trade agreements were not about trade as we think of it. “New generation agreements, negotiated in secret, aim to prevent governments from regulating corporate interests,” Kelsey said. For example, about half the 30 chapters in the Trans-Pacific Partnership agreement can limit how governments protect health, by allowing longer monopolies for medicines, least restrictive standards for food and chemicals, and by not allowing new restrictive regulations on professions, health insurance, hospitals and online health advice. “Foreign investors have guaranteed protections if government actions substantially affect their profits or value. The investor’s bad or unlawful behaviour is irrelevant,” she said. She gave several examples of recent high-profile cases where corporations demanded massive compensation from governments. Uruguay was sued by tobacco giant Philip Morris over tobacco regulation, Canada was sued by pharma company Eli Lilly over pharmaceutical patents, while Ecuador was sued by Pfizer for the same reason. Free Trade Agreements (FTAs) with such provisions which privilege corporations have a chilling effect on health policies. There is massive popular resistance to such regional and mega FTAs. To achieve really progressive alternatives, it needs to be ensured that new deals do not close off the regulatory space, and existing agreements have to be terminated and/or re-framed. Real alternatives must be developed – for instance, Ecuador is leading UN Human Rights Council negotiations on a binding instrument imposing human rights obligations on transnational corporations. Hossain Zillur Rahman from the Power and Participation Research Centre (PPRC) at Dhaka, Bangladesh, drew out the contrast between what he termed the “indicators of hope” and “statistics of despair” with respect to the health situation in Bangladesh. While there have been substantial improvements in child and maternal health, life expectancy and sanitation in the country, coverage of essential health services remained at 50%, births attended by skilled health personnel was inadequate at 42.1%, and 5.25 million people have been pushed into poverty due to out-of-pocket expenses. Concerns about the quality of newly trained doctors, and about poor and middle classes being priced out of quality healthcare needed to be addressed, Rahman said. The urban poor seems to be an “abandoned” group in healthcare. Amit Sengupta, associate global co-ordinator of the PHM, said that the politics and economics of the world was defined and determined by the dominant paradigm today – which is loosely termed as globalization. “So, to understand the political economy of health we need understand what Globalisation stands for, how it works, and how it affects our lives – including our health,” he said. There has never been so much wealth in the world as today, but inequalities are so colossal that the 8 richest billionaires own as much combined wealth as half the human race. Science and technology has improved immensely, and tools for improving conditions of living are available as never before, but the resources of governments are used to bail out big corporations even as working people are forced to bear the brunt of austerity measures. Wars continue to fuel the armaments industry, with the occupation and increasing repression faced by Palestine reminding us that global capitalism needs wars to survive. The WHO-led UN system for global health governance, meanwhile, is being replaced by a system led by philanthro-capitalists such as the Bill and Melinda Gates Foundation. Even as our planet stands on the edge of destruction, Jair Bolosonaro, the newly elected President of Brazil, has chosen a foreign minister who claims that climate change is a Marxist conspiracy! “Ultimately, the struggle for health for all is a struggle for a more caring world,” Sengupta said. Earlier in the morning, the People’s Health Assembly’s opening ceremony was chaired by Fazle Hasan Abed, chairman of the international development organisation, BRAC. Abdul Malik, national professor of Bangladesh and president of the National Heart Foundation of Bangladesh was the chief guest. Other speakers at the session included Fran Baum, distinguished professor at Flinders University, Australia, and Hossain Zillur Rahman of PPRC. A message to the Assembly from Bangladesh phone minister Sheikh Hasina was read out at the opening ceremony. 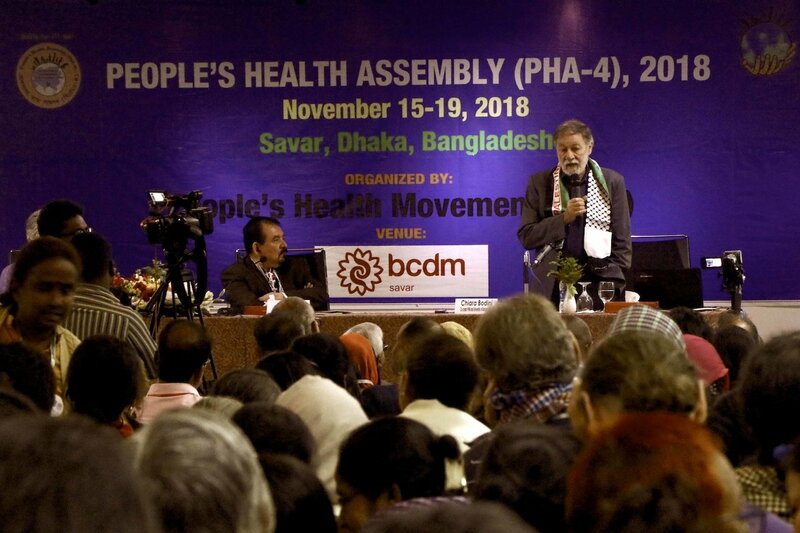 Discussions at the People’s Health Assembly’s opening day continued till the evening, with sub-plenaries and workshops on topics such as global governance of health, sustainable development goals, trade and health, and military interventions, occupation and refugees.